Of all the change management models theories and ideas discussed - how to create a programme that actually delivers the benefits - is the only thing that really matters. And that can only be consistently achieved by addressing all of the key factors that will make that possible - and that is the whole point of a programme. The output of the Pre Programme Review and Planning will have helped you think through many aspects of your proposed step change and will provide the input as you create a programme. The answer to: "How am I going to manage [or lead!] all this so that it happens and I succeed?" is derived from a clear understanding of the key roles that need to be fulfilled - to make it possible. Each of these roles may be a full-time role or a part-time role. The deciding factor is the scale and complexity of the step change you are seeking to implement. The amount of time allocated to the role is at this stage very secondary to the fact that the role and process is fulfilled. What is of paramount importance is that somebody understands and owns the execution of each role - whether it takes them 10 minutes per day or all day every day! In a sense the amount of time required is secondary to the fact that the role is defined, recognised and allocated to a person with the appropriate skill, and personal authority to exercise the role. You will almost certainly NOT succeed, if these roles and the processes inherent in the execution of these roles are not fulfilled. As with everything from this point onwards, as you create a programme, it doesn't matter whether or not you use the "language and jargon" of programme management or not. It doesn't matter whether or not you call it a programme. But, what does matter enormously is that you fulfill all of the core roles, functions and processes that are outlined in this and the following sections. Am I being prescriptive? Yes I am! 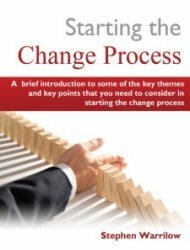 But only in so far as we are outlining generic principles and processes that are universally applicable in step change situations - and especially for mid range corporates and larger SMEs. The role of Programme Director is the role of leadership - ideally transformational leadership - and total ownership of the programme, and visibility in that role. It is the Programme Director's responsibility to create a programme. It surprises me how often step change is embarked on without clear leadership at the helm. The role of Programme Manager is rather more obvious in that it is about the practical day to day management of all aspects of the programme. This is usually on behalf of the Programme Director, but in smaller organisations and / or in smaller step change initiatives it may be fulfilled by the same person. What matters is that the roles are identified and fulfilled. The other less obvious but critical role is that of Business Change Manager who is totally responsible [to the Programme Director] for making sure that the benefits of the programme are realised. And this happens after the delivery of the new capabilities [via the projects and task initiatives within the programme]. Along with the leadership role of the Programme Director, this role is often - usually - not understood, defined or fulfilled. 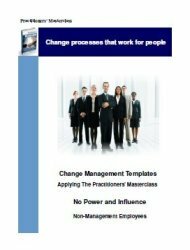 So it's hardly surprising that 70% of ALL step change initiatives fail to realise the benefits - if no one is specifically tasked and empowered and held accountable for the process of benefit realisation. This is just a fancy term for a description of how your organisation is going to look after the step change. As you create a programme, the more detail and clarity you have about this, the greater the chance you have of being able to communicate it to your staff and customers - and the higher the possibility that you will actually achieve it. 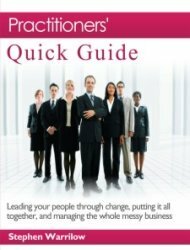 I often ask people directors how they envisage their organisation looking after the change - and all too often the answers are fairly vague - or expressed in terms of "bigger", "better", "closer to customers", "more efficient / profitable / cash flow..." etc. ...your changed organisation will be different. 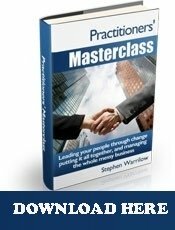 As you create a programme, if you don't know with pristine clarity how's it going to benefit your organisation - then you are unlikely to realise it. Sounds obvious, doesn't it? And I really don't mean to sound so pedantic - but you would be surprised but how many times I have asked the question: "How will it benefit you and how will you know it's benefited you?" - and got a vague or general answer along the lines of "we'll be... bigger... better... closer to our customers... reduce our costs... etc"
- What each benefit is? - What differences will be noticeable before and after? - Exactly where in the future organisation it will arise? - How will it be measured? The management and monitoring of these processes is key to ensuring that you actually do benefit as an organisation from the planned step change and the new capabilities that the change will be delivering. And - as outline earlier - all this is the responsibility of the business change manager. This is all about: "Who is this step change going to affect and how are they going to react?". As you create a programme, a big part of this will have been uncovered and discussed during the Pre Programme Review and Planning stage - but this is the time when this is really unpacked and explored very carefully. If the step change has any actual or perceived negative aspects e.g. redundancies, re-location, major change of working practices etc then the Kubler-Ross Grief Cycle or the Change Roller Coaster will apply. This is when the full impacts - positive - negative and indifferent need to be thought thro and explored carefully and all potential issues examined. How well you listen to and respond to ALL of your stakeholders' issues - and are seen to be doing so - is a significant measure of the effectiveness of your management of these communciations and relationships. 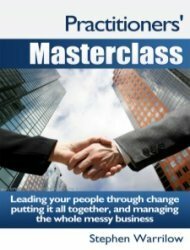 Leadership skills make a big difference to successfully managing all stakeholder relationships. This is where the management of impressions and expectations - how things are seen - and how they are interpreted - matters. As you create a programme, this is all about: "What can I do to get them 'on side'- and keep them there?" Ultimately the success of your communications strategy will be defined by how much "buy in" and "ownership" you achieve. The stakeholder analysis will have determined all of the different interest groups, and the cultural analysis in the Pre Programme Review and Planning stage will have identified the deeper issues to be overcome. All of this will shape what you say, who you say it to, when you say it, and how well you listen and respond to what they have to say. Good communication is essential to releasing the benefits of your programme of step change. This is the area where most people are strongest and focus most of their attention: "What steps do I have to take to make the changes and the get the benefit of this change?" As you create a programme, you need an overall schedule of all of the intiatives and projects that are going to deliver the new capabilities that will realise the benefits. Because a programme approach takes the wider view, you will be looking at managing carefully the links, overlaps and dependencies between these projects. 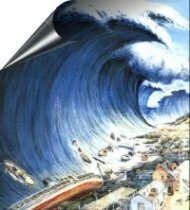 The over-riding purpose of the plan is to ensure that nothing jeopardises the delivery of the capabilities and realisation of the benefits. One further aspect of this stage is the collation of all project documentation e.g. business case, description, dependencies, risks, deliverables, dates etc. 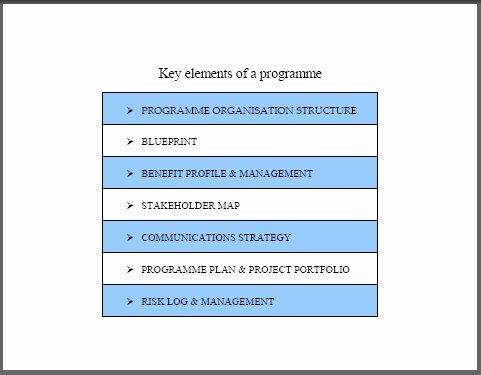 The Pre Programme Review and Planning stage will have identified each of the issues that you are likely to face as you move through the main steps via the EEMap process. The risks are logged in the programme risk log and regularly reviewed. Most people reading this will be very familiar with the practise of risk assessment. 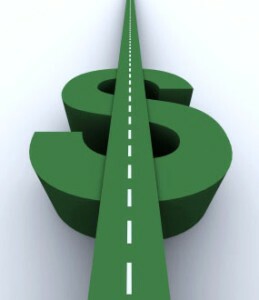 However the usual focus is on risks at a project level - i.e. risk to the deliverables. In a programme management approach, we are paying an equal amount of attention to risks that threaten the realisation of the benefits.